Dread leaving your 20’s? Don’t fear your 30’s because birthdays are good for you: the more you have the longer you live. Wear 30th Fanci-Frames to show you’re embracing the inevitable rather than dreading the big 3-0. These are plastic novelty sunglasses without lenses done in a metallic finish available in assorted colors of blue, purple and red. Specific colors cannot be requested. Show that you think of yourself as a classic in the making with 30th Fanci-Frames. 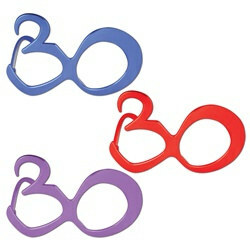 Struggling to find great decorations and accessories to celebrate a 30th birthday? Struggle no more by browsing through our 30th Birthday selection to find everything you need.